AFC Fylde have completed their fourth signing of the summer after agreeing terms with highly-rated Welsh midfielder Henry Jones. The 23-year-old attacking midfielder has put pen to paper on a one-year deal with the club, subject to international clearance, with the Coasters having an option on a second year. Jones scored 14 goals in 32 appearances for Bangor City last season. He also had 10 assists and was named Young Player of the Year in the Welsh Premier League. A former Wales Under-21 international, Jones began his career with Premier League side Swansea City, rising up through the ranks from the age of eight before turning professional at 18. He featured for the Swans’ Under-21 side before switching to Bangor last summer. Jones helped Bangor to finish fourth in the table, securing qualification for the Europa League. 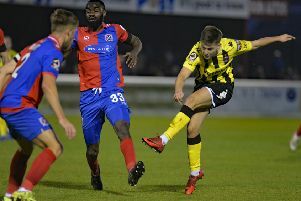 The midfielder will team up with fellow new boys Jordan Tunnicliffe, Lewis Montrose and Zaine Francis-Angol next week, when Fylde return for pre-season training.